On Wednesday 21st November 2018 the first ten students to achieve the bronze ‘Reading for Pleasure’ Award were invited to King Edwards Camp Hill Boys to see the author Chris Bradford. He is the author of the award winning Young Samurai series and the Bodyguard series. He is a true believer in ‘practicing what you preach’ as he is trained in samurai swordsmanship and is a qualified bodyguard. His talk was therefore extremely entertaining as he wielded a sword and taught the students some bodyguard moves. 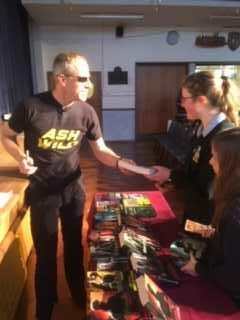 The students also really enjoyed the opportunity to be able to purchase books and spend time talking to the author whilst they got their books signed.